A type of kitchen utensil that can be used to heat cooking oils (fats) so foods can be completely covered in hot oil to be fry cooked, also referred to as "deep fat fried". Deep Fryers, which may be known as Deep Fat Fryers or Flash Fryers, are built for home use and commercial use, the difference typically being size and features. Home fryers are smaller in size with smaller oil capacity chambers and are built to fry less amounts of food so individual portions or servings for only a few can be fried. Commercial varieties will often contain larger capacity oil chambers for greater amounts of food. Deep Fryers may consist simply of a deep walled pot made from cast iron, black steel or stainless steel that are used on stovetops. These pots at times have fry baskets that fit within the pot to hold the contents being fried while other pots may simply use nest baskets or slotted spoons to place and remove foods from oil chambers/pots as they cook. In addition to stovetop fryers, many smaller Deep Fryers are built as electrical appliances so the cooking can be accomplished on a countertop. Larger electrical Deep Fryers also are made for both home or commercial use. The larger units may be self contained countertop units with one or two removable fry baskets or larger versions for more heavy-duty frying tasks such as for use in restaurants. 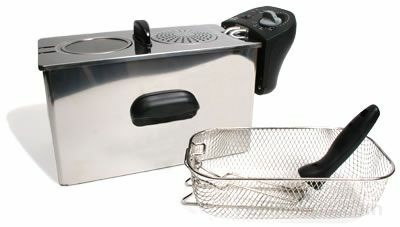 A countertop Deep Fryer generally consists of a temperature controlled, cooking chamber to hold the cooking oil, which may or may not have a lid. Smaller units most often have lids while larger commercial units have open tops. The chamber, which is also referred to as a pot or bowl, may be removable for ease of cleaning. It is common for some Fryers to be fitted with one or several removable baskets which may be round, square or rectangular in shape. The baskets hold the food as it is immersed in the oil, while other types of Fryers, typically the smaller variety, are not made with immersion baskets, so the food is placed directly into the bottom of the cooking chamber. Sealed frying chambers are often standard equipment on larger Deep Fryers and are not that common on the smaller variety. The cooking chambers of the different Deep Fryers built for home use will have capacities made to hold a quart of oil while some larger models will hold several gallons and may be large enough to fry whole ducks or a medium-sized turkey. The fry baskets will be made so the handles keep hands away from the hot grease and so the grease drains easily out of the basket as it is removed from the oil chamber. A glass lid that allows food to be inspected as it fries is a nice feature but not totally necessary as long as the unit has some type of lid to keep the grease from splattering out. Some Fryers will have removable or replaceable filters built into the machine that assist with keeping food odors in the frying chamber however, it is difficult to totally contain all odors that are emitted from the Fryers. Countertop Fryers have electrical components built into the unit that control the temperature and allow for different settings for various types of food. Digital temperature controls are common with adjustable thermostats that keep the temperature maintained. The Deep Fryer may also be built with zoned temperature controls to keep the heat consistent throughout all areas of the Fryer. Temperature controls may have ranges that begin at 300ºF and almost reach 400ºF or more at the upper end. For home use, the cooking oil in many Deep Fryers will heat to over 300ºF within 10 minutes. With the ability to maintain lower temperatures, some Deep Fryers can be used as fondue pots where the temperature setting requires keeping contents only melted and not cooked. When selecting, consider the value of the Fryer holding larger amounts of oil so as food with a cooler temperature than the oil is added, the heat of the oil is not reduced as rapidily as it is with smaller amounts of oil. By decreasing the drop in temperature from the food that is added, the Fryer can be recover faster to decrease the cooking time. Also, a larger capacity allows for fewer batches to be fried. Other features that are of value to consider in Deep Fryers is the oil drainage system with the Fryer. Some models have containers and draining systems making the removal of the hot oil safer and easier so it can be drained through an outlet into a storage container rather than requiring the tilting of the cooking chamber or oil pot to drain the oil.